With AMD Ryzen 2nd generation rumors in the air, we wholly expected the chip maker to tease its next generation processor family, and that’s exactly what we got. What we didn’t expect was for AMD to preview its roadmap on CPUs and GPUs going into 2020. Before we get to ahead of ourselves, you should know that Ryzen 2nd gen chips will release this April. 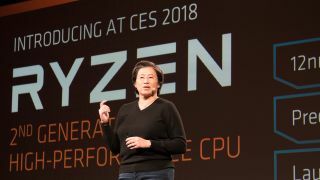 Built upon a new 12nm Zen+ architecture – out-smalling the 14nm transistors of Intel Coffee Lake – AMD promises Ryzen 2nd gen will bring higher clock speeds and Precision Boost 2 technology for greater performance and efficiency. Unlike Intel, AMD is sticking to the same AM4 socket, so users looking to upgrade to Ryzen 2nd gen won’t have to buy a whole new motherboard along with it. However, Ryzen 2nd gen will get a new X470 chipset that’s optimized for the new processor family and lower power consumption. Given that we’re already starting to see SenseMi improvements in AMD’s new Ryzen-based desktop APUs, we can expect the same performance and efficiency increases in the company’s next processor line. This includes optimized power usage through Pure Power smart sensors and greater overclocking potential through Extended Frequency Range 2. AMD hasn’t announced anything concrete on new processors or features yet, but we’re sure to hear more in the coming months. AMD could have stopped with a simple tease of the Ryzen 2nd gen, but carried on by showing off its roadmap going into 2020. By the second half of 2018, AMD promises second-generation Ryzen Threadripper and Ryzen Pro processors. AMD also predicts its 12nm Zen+ architecture will evolve into a 7nm Zen 2 and then 7nm+ Zen 3 by 2020. Meanwhile, the chip maker sees an equally optimistic outlook for its graphics architecture. At a pre-CES event, AMD announced that it had produced a 7nm Radeon Instinct Vega chip designed specifically for learning applications. From there 7nm Navi would be AMD's next consumer oriented graphics card release, which then would be followed up with a 7nm+ yet-to-be-named next-gen platform by 2020. It’s an ambitious plan that spits in the face of Moore’s Law and while a little skeptical, we hope it’s a goal AMD can achieve in just two short years. With the promise of Ryzen 2nd gen around April, and a look at AMD’s future roadmap, it might not make sense to get an OG Ryzen or Ryzen Threadripper processor at this point, but the company is throwing some big savings to finish off the series with a bang. You can see all the price cuts above and you’ll will be able to save anywhere between $15 (about £10, AU$20) to $150 (about £110, AU$190) on last year’s biggest processor launches.